Seun Oyeniran's Blog: RE: Can Nigeria Outstrip Italy and Canada? RE: Can Nigeria Outstrip Italy and Canada? 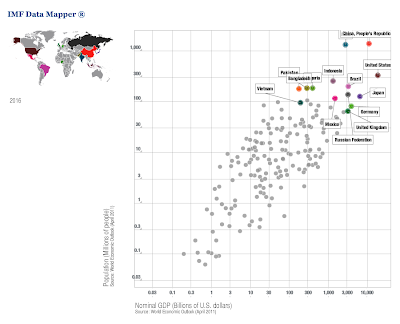 Global Disparity| Looking beyond Africa (Nigeria), we see a global disparity that has taken shape in the last three decades. Many countries that were thought to be economically advanced and "stable" have witnessed huge economic crisis that has shake their policies to the roots. Its interesting what is happening globally today. Although coming at the cost of war and conflicts, many African countries (and other developing and emerging economies) are consolidating their democracies and putting in place many policies and reforms that will entrench sustainable growth and development. Contrary to what is happening in Africa, the recent downgrading of America's Investment Rating from AAA to AA+ for the first time since 1941 by the Standards & Poor's should paint a better picture of the direction in which growth in take in the global space in subsequent decades to come. It is important to also mention that the recent upheaval against Wall Street (Occupy Wall Street) shows that times are truly changing a phenomenon some call response to "Corporate Greed". These developments fits neatly with the struggle to recover from deficits in many European countries leading to many European government budget cuts and resulting in the worst ever protest and street rioting all of which should make us understand that there is tendency for multinationals to begin to look into Africa for business purposes. In fact countries like UK and USA that have delayed their moves to spread their businesses to Africa are already beginning to reap the brunt of their inactions. Lets take a vivid look at the disparity in a chat I present below. 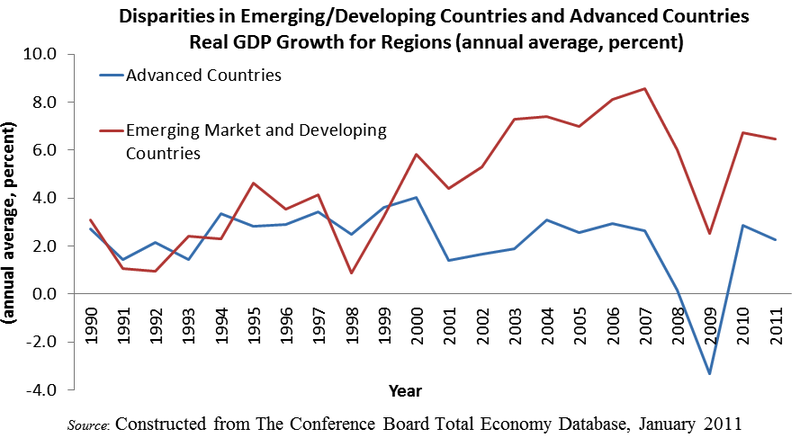 In 2007, real GDP growth rates for emerging/developing economy was 8.7% when compared with 2.6% for advanced economies. Despite the fact that both regions’ growth rate declined, it remained at 6.5% and 2.3% for emerging and developing economies and advanced countries respectively in 2011. The disparity lingers on to the present since it started from the year 2000. 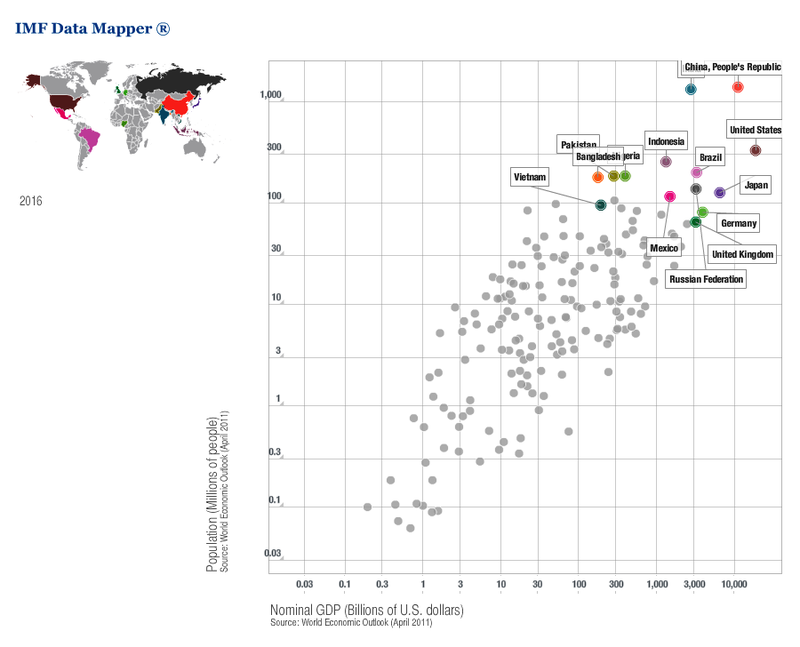 Another way the global disparity is seen is the case where certain countries such as Nigeria which are endowed with high population are coming higher up the matrix when interpolated nominal GDP. This is illustrated below. The Convergence Theory | We can use the convergence theory to partly justify the stand that Nigeria can outstrip Canada and Italy. Its a simple economic theory that combines some aspects of endogenous and exogenous growth theories. The idea of convergence in economics (also sometimes known as the catch-up effect) is the hypothesis that poorer economies' per capita incomes will tend to grow at faster rates than richer economies which will be witnessing what Robert Solow called "steady state". Consequently, what we now see will be a resultant: both emerging/developing economies (BRICS+N-11 Nigeria inlcusive) and the advanced economies should eventually converge in terms of per capita income. 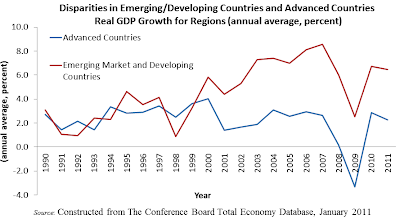 Developing countries have the potential to grow at a faster rate than developed countries because diminishing returns (in particular, to reproducible capital) are not as strong as in capital rich countries. Furthermore, poorer countries can replicate production methodologies, technologies and institutions currently used in developed countries making them achieve quicker growth rate within a short time. The essentially of good operational environment is inevitable as we call for peace across the African continent. A social externality cost is incurred and recipe for disaster guaranteed when young people lack skills that can lead to gainful employment due to poor education funding especially in highly populated countries. Hence we call for more funding for education. Needless to say that funding education will lead to production of entrepreneurs who will ultimately stimulate wealth and income creation and a further growth in agricultural and service sector will ensue due to persistent technical progress. My answer to the question remains a yes, Nigeria can!